Infrared Imaging are opted for producing images that are invisible through naked eye. The device operate at an electromagnetic spectrum of 9,000-14,000 nanometers. Infrared imaging cater its application in diverse end-user industry such as transportation, manufacturing, information technology among others. Currently, private and security segment is the dominating segment for global infrared imaging market and is anticipated to be dominant in the forecast period. This is followed by industrial, healthcare, defense and law enforcement. This report incorporates an in-depth assessment of infrared imaging market by technology, geography and others. With respect to geography, North America is the leading region for infrared imaging market accounting for 34% share in 2017.Asia-Pacific region is expected to have significant growth in forecast period. South Korea, China, India are the key region in the Asia-Pacific region. According to the Indian Bureau of Mines, the iron ore production has reached 160 million metric tons in 2017 which was 150 million metric tons in 2013, thus driving the demand of infrared imaging products in the iron ore production. What are the major applications for Wide Area Surveillance Infrared Imaging? Wide Area Surveillance System refers to an intelligence-based automated solution which offers wide-area surveillance capability to predict, detect, track, identify, classify, respond and resolve incursions. This solution enhanced situational awareness for force protection, critical asset and infrastructure, and special event security. Wide area surveillance infrared imaging are primarily used in different application for civil intrusion, suspect tracking, hazard and disaster management, route reconnaissance and over watch, large event monitoring, Terminal Security, Perimeter security and many more. Wide area surveillance infrared imaging market is estimated to grow at a CAGR of 7.5% in between 2018 to 2024. Increasing number of criminal activities and threats to public are creating need for the security systems thus propelling the growth of wide area surveillance infrared imaging market. 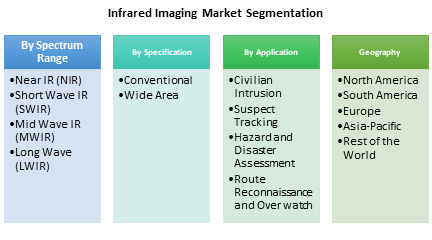 Reconnaissance is the leading segment for WAS infrared imaging market. Hazard and disaster management is the fastest growing segment for the WAS infrared imaging market. Who are the Major Players in Infrared Imaging Market? The companies referred to in the market research report includes FLIR systems Inc., DRS Technologies, Fluke Corporation, Axis Communication and others. Infrared Imaging market has numerous players catering across several domains of industry. The top companies are targeting to launch new IR imaging products with the requirement of diverse end-user application such as security, military & defense, industrial & commercial, automotive among others. Figure 9: FLIR Systems Inc.